Enjoy the peaceful rural setting.. I look forward to seeing you soon.. Enjoy the sauna as well. Le Papillon Day Spa In Cambridge has been created as an escape for you to enjoy and leave the stresses of your everyday life behind. Just a 20 min drive from Hamilton. 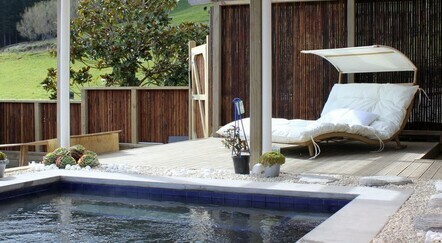 Le Papillon Day Spa is a small, exclusive rural retreat, offering you all you can expect from a Day Spa. As there is one therapist the size of the groups is limited to 4 or 5. At Le Papillon Day Spa I use the natural Janesce Skin Care Products. Janesce is not just a skin care, it is a life philosophy. Offering menus for specific skin conditions, you will learn to work from the inside out. Only by taking care of your whole body can your skin look good. Group Spa Packages, 3 to 4 people, come and enjoy a massage or facial and the Spa facilities, from $110.00 pp. Hens Parties, bring your bridesmaids, 4 to 5 ladies, along and unwind before the big day. Individual or Duo Spa packages. The treatments will be given one at a time so there is more time to relax while one person is enjoying their treatment. In the 'Shop' you can purchase gift vouchers for a treatment or a cash value. Vouchers will be couriered to you or you can have them emailed to you if you need it urgently. For terms and conditions see About Le Papillon You can also purchase skin care products online for your convenience. *Whenever you purchase a Gift Voucher can you please state the name of the person who is receiving the voucher. If you would like me to add a message I can do that as well. Looking for a lovely gift? Absolutely amazing spot with beautiful views. Thank you for a wonderful relaxing time. A lovely break from the kids with the time out package. Will have to come again soon. Should you wish to amend or cancel your Spa treatment, please give me at least 24 hours' notice to avoid being charged the full treatment costs for unused spa room and therapists time. For Spa packages I require 48 hours' notice for appointment alterations or cancellations. This is also required when you are using a voucher. When confirming a Spa Package a $75.00 non-refundable deposit is required. When booking your treatments try to book at least a week in advance to avoid disappointment. Bookings can be made BY APPOINTMENT only. Le Papillon Day Spa is CLOSED on Sunday's, Monday's and all Public Holiday's.